One of the biggest barriers to getting started with your online business is often shipping. It's one thing to make or acquire products to sell online, but once you make a sale, you have to find a way to get your item to the customer. Dealing with different types of shipping, finding suitable mailing materials, and waiting in long lines at the post office can seem like a nightmare of insurmountable tasks. Lucky for you, Bonanza's fulfillment process is streamlined and easy to understand. This article will outline exactly how to set up your shipping preferences, what to do when you make a sale, and how you can take your package from a plain cardboard box to something that will leave a lasting memory for your customer. Set up shipping options in your booth. There are a few ways to do this. The first is by selecting "Booth Settings" in the Selling dropdown menu located in the upper lefthand corner of the site. Select the second tab from the right labeled "Shipping & Returns." From there, you can set your default shipping preferences. Be sure to save all changes when you're finished. If you'd like to specify shipping options for a specific item or set of items, you can do so through the Batch Editor. Select "Batch Edit Items" in the Selling dropdown located in the upper lefthand corner of the site. Select the items you'd like to add shipping for. 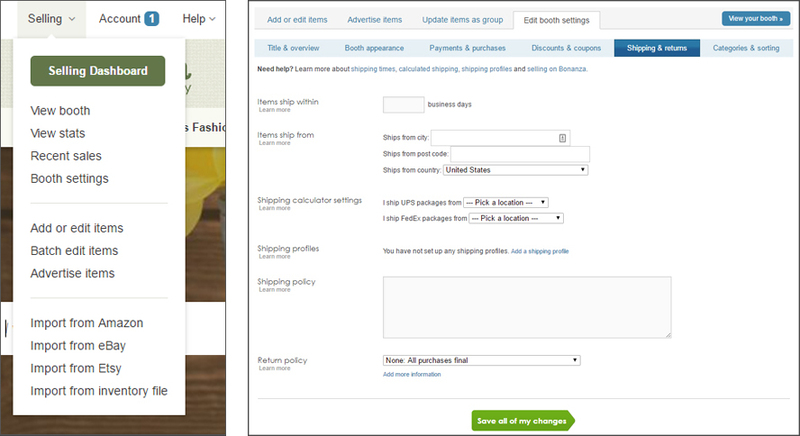 From there, select the second option labeled "Shipping" and apply your desired settings. Congratulations, you've made a sale! Now what? Nothing beats that rush of joy you feel when you sell an item on Bonanza. Your buyer is also excited to receive their package and is anxiously waiting for updates on its whereabouts. Many buyers take shipping time into account when they leave feedback, so it's important to ship your item in a timely manner. When you login to your Bonanza account and visit the Selling Dashboard, you'll be notified of your new sales and which orders need to be shipped. 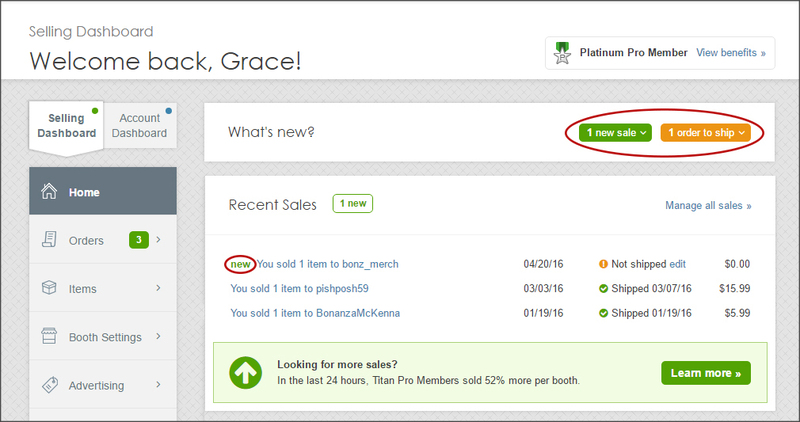 Clicking on the orange button labeled "Orders to Ship" or the item link in the "Recent Sales" section of your Selling Dashboard will take you to the order summary. At the bottom of the transaction summary, there is a link to buy shipping or (if you've already purchased shipping from an outside provider) mark the item as shipped. Clicking the "Buy Shipping" link in the transaction summary will expand our easy three-step process for buying shipping. Simply enter the package type, weight, dimensions, and the shipping date and select which mail service you'd like. Next, you can add safeguards like package insurance or signature upon delivery. Finally, you can review your selections and purchase your shipping label. You can then click "Print Label" and your label will open in a new tab or window. Once you have your shipping label and tracking information, you are ready to mark your item as shipped. You can do this by clicking the link in the transaction summary. If you purchased your shipping through Bonanza, your package will be marked as shipped automatically. Otherwise, enter the mail carrier and tracking number when prompted so your customer can stay informed throughout the process. It's important to ship your item the same day you mark your item as shipped so your customer knows when to expect their package. Whether or not your item is breakable, it's usually a good idea to add some sort of insulation to your package, as it may get shaken up and tossed around in transit. If your item is fragile, you should take extra precautions like using bubble wrap and "Fragile" stickers to ensure its safety. You can also add a variety of safeguards to your package to ensure a safe delivery. You can add insurance to the package in the event that it is damaged in transit. You can also add a mandatory signature upon delivery to protect yourself from future liability once the package has been delivered. As a seller, you are responsible for the safe delivery of the item. Requiring a signature for the package establishes written confirmation that the buyer has accepted responsibility of the package. Cost effectiveness of your package. If you sell a leather wallet or a pair of sunglasses, it wouldn't make sense to use a box that would fit a guitar case or a 60-inch TV. On the other hand, you don't want your item to be squished into a box so tightly that it's impossible to remove or ends up damaging the item. Make sure you choose a box that is a cozy fit for your item. Like Goldilocks, you want your box to be not too big, not too small, but just right. The box itself. Is it fresh and clean, or does it have old labels from other purchases haphazardly crossed out? Is the label straight and easy to read, or does it have sloppy writing or label attachments? Packing materials. Using fun printed tissue paper or colorful crinkle-cut paper shreds can add a welcome and refreshing element to your package. You can also use patterned packing tape, fun stamps, and other ways to make your package pop. Branded materials. Do you have flyers, brochures, or business cards that you use for promotion and networking purposes? Feel free to include these in the box. Some sellers also like to include a custom coupon code to encourage repeat shoppers. A small token or gift. In the restaurant industry, it's called an amuse-bouche, but most companies simply call it the wow factor. Adding a special surprise, like stickers or candy, is unexpected and will delight your customers. If you don't want to purchase anything extra, including a handwritten note of thanks is an easy way to add a personalized touch. A receipt of purchase. Although customers receive email confirmation, it's nice to include a printed copy of the transaction summary in case the customer would like a physical receipt. Click the "View packing slip" link under the order summary on your "Selling > Recent sales" page to print a copy of the receipt to include in your package. Once you've physically shipped your package, be sure to follow up with the customer. Thank them for their business and provide them with tracking information. When it comes to buying items online, extra communication is always appreciated. You should also leave feedback for the buyer that will hopefully remind them to leave feedback for you. #protip: follow along with the tracking information and leave your buyer feedback the day your package is delivered. It will remind the buyer to leave feedback for you, and they'll be in a great mood because their item has arrived! By following these easy steps for fulfilling your orders, your business will be booming with repeat customers in no time! For more articles on how to succeed at Bonanza, check our our Seller Success Series.